Bump in the Beltway: "Corn"
Thanks to Melanie from Bump in the Beltway for this great cross-post! NEW YORK: U.S. farmers are planning to plant more corn this year than at any time since World War II as farmers rush to cash in on high prices bolstered by demand for ethanol. The United States Department of Agriculture released a report Friday on prospective plantings that estimated that American farmers would plant 90.5 million acres of corn in 2007, a 15 percent increase over last year and the most since 1944. Considered one of the most highly anticipated agriculture reports in years, if not decades, the prospective plantings report promises to have broad implications throughout the agriculture, food and energy sectors. The rush to plant corn comes at the cost of other crops, particularly soybeans and cotton. The Department of Agriculture said that if farmers followed through with their stated intentions, soybean acreage would drop 11 percent and cotton acreage would fall 20 percent. "This year, we are planting wall-to-wall corn," said Webb Bozeman, a farmer in Flora, Mississippi, who normally plants cotton, corn and soybeans. "Corn is profitable. Cotton is pretty much break-even at best." 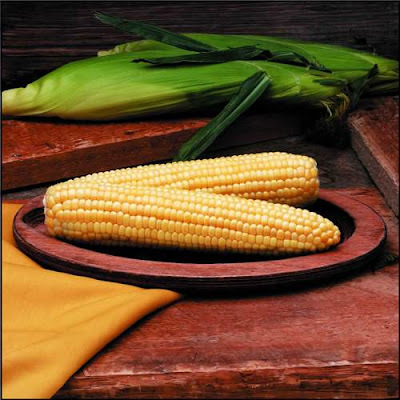 Commodity markets reacted immediately to the report, with corn futures falling 5 percent. Soybean futures also fell, about 3 percent, but they have gained more than 30 percent over the last year on expectations that farmers would reduce acreage. Cotton futures rose about 0.5 percent. With corn prices expected to soften, at least temporarily, the report should ease concerns about rises in food costs, which had started to tick upwards. As you know I love to cook and love good, fresh food. It's impossible to tell from this story what kinds of corn are being planted this spring, but the really, really exceptional human food we get around here comes mostly from the eastern shore of Maryland and the Delmarva and it is some of the most exquisite stuff I have ever eaten. I live a pretty spare life and don't crave or require much in the way of luxuries, but I have two in which I indulge every summer: I eat as much fresh sweet corn and heritage tomatoes as I can carry home from the Farmers' Market each week. After all, that has to hold me for the rest of the year. To me, heaven would be to have a yard with a big vegetable garden. Since I'm without that, I'm scheming to lay out my herb garden in the sunny patch on the retaining wall that lines my back stairs. Tips for serving corn on the cob which will keep your guests asking for more: don't shuck it until you are ready to put it in the pot. If you want to steam it in the coals of your grill, soak the unshucked ears in a sink full of cold water for 30 minutes and then lay the ears directly on the coals: fresh corn will steam in about 15 minutes. You can also char the shucked ears on top of the grill for a very different flavor. Use olive oil on both the grill and the raw ears to get a good char without burning. To serve: use unsalted, whipped butter and sea salt or popcorn salt (they stick better.) Give me a pot full of Silver Queen 606 and a couple of Millionaire tomatoes, some salt, butter, fresh basil, olive oil, some fresh mozzarella and a pepper grinder and dinner is served! It was warm enough to grill out here today and the cherry blossoms have just begun to bloom. At this time of the year, the Mid-Atlantic is in its glory. Except for the pollen, of course. My eyes itch.